Caboholics Favorites - Welcome CABOHOLICS! Here are the results of the Caboholic Choice Voting we've had going on during the first part of 2015. Remember, these choices come only from the people in this group, and reflect only one of many favorite places! 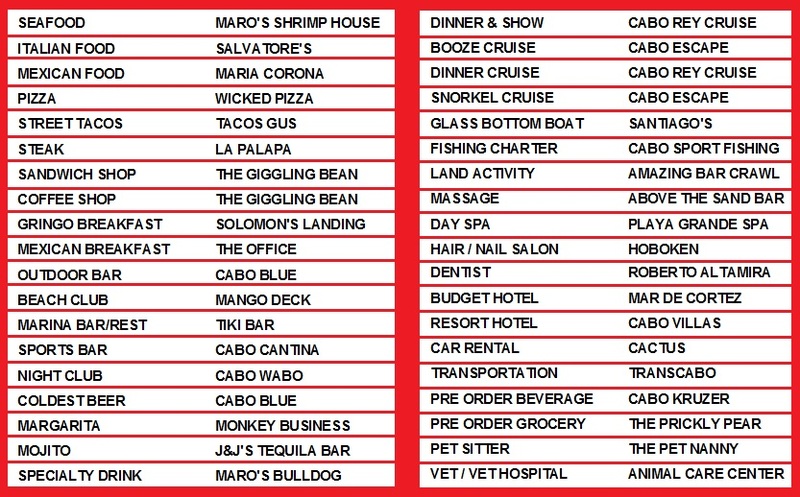 The top three are listed further down this page, and there's a whole other world of places to go and things to try in Cabo, don't limit yourselves by any means ... go out and try a few new places and be ready to nominate a whole new list next year! The list below shows the top 3 Choices for each category. All Great Choices! There are just too many choices to really say which is the best of the best. Below is a list of the top three that were chosen for each category by Caboholics during August 2015.